The National Bison Range (NBR) would like to extend a huge Thank You to the Missoula County Weed District (MWCD), the MT Biocontrol Coordination Project (MBCP) and the participants of the 2015 Biocontrol Workshop for sponsoring, facilitating and attending the NBR biocontrol tour on June 4th. The NBR has been using biological control agents as an invasive species management tool for nearly 60 years on more than ten species of invasive plants. In recent years, we have focused on bolstering our populations of Mecinus janthinaformus (MJ) across the Refuge. These weevils have been helping combat hillsides of Dalmatian toadflax, with evident signs of success. For the tour, we planned an informative day about biocontrol systems in which everyone would be able to collect and re-distribute populations of MJ to certain areas on the refuge. The NBR staff monitored the Dalmatian toadflax populations on the range ahead of time to determine which sites were suitable for MJ collection and which sites needed more agents released. Participants were interested to see the difference between the sites and found it valuable to witness the entire process of collecting, releasing, and monitoring the MJ populations. The day of the tour, the 20 participants, along with MWCD, MBCP and NBR staff, traveled out to a stretch of Dalmatian toadflax speckled with MJ weevils and bearing significant signs of their herbivory. Everyone was enthusiastic about collecting and, despite the rocky slopes, folks willingly clambered up toward the tops of ridges, where collection is best, to gently tap MJ into containers. The collection efforts were a great success and spirits were high after counts came in at 13,000 agents. Such a large number was quite an accomplishment for one day; one that would’ve taken bison range staff several collections to obtain on their own. The amount of collected weevils and the many helping hands allowed us to make releases across a large area on the refuge where MJ numbers were lower and the vigor of the toadflax was stronger. The successful day was made all the better by the fact that the participants and facilitators were an amazing group of people from diverse backgrounds that brought an interesting array of rangeland and weed management knowledge with them. The conversations were intelligent and informative, giving us all an opportunity to evaluate our management techniques, as well as share successes and failures. We are very grateful and honored to have had the tour come to us and, we hope that everyone enjoyed the day as much as we did. On behalf of the Stillwater Valley Watershed Council (SVWC) board of directors, I would like to thank Melissa Maggio-Kassner and the MT Biocontrol Coordination Project (MTBCP) for aiding in the organization and facilitation of the SVWC’s inaugural biocontrol workshop held in early July, 2016 in Fishtail, MT. The Stillwater Valley was one of the first leafy spurge biocontrol release areas in the state. 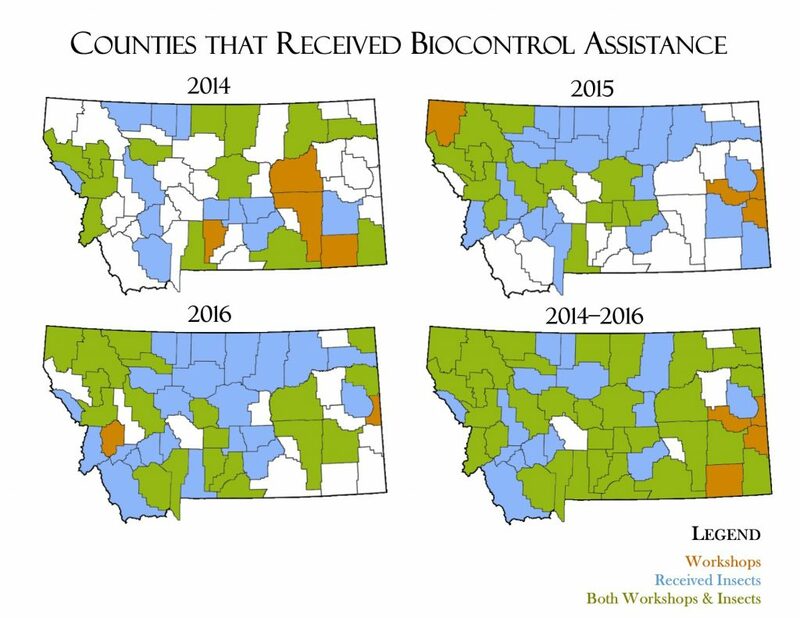 Since the mid-80’s, biocontrol agents have been used extensively as one tool for invasive species management for the difficult to manage leafy spurge. However, leafy spurge continues to gain a foothold in many areas of the watershed and so in recent years there has been a focus on bolstering populations of Aphthona species, A. nigriscutis, and A. lacertosa in order to effectively use more of the tools in the weed control toolbox. For the workshop, an informal but informative day was planned focusing on biocontrol systems in which everyone would be able to first gain more in depth knowledge about the most common biocontrol agents in MT in a classroom setting. Participants were given a background of the various agents and their target noxious weed species as well as an honest viewpoint for the pros and cons of many biological controls. Next, the afternoon session took the group to a local landowner’s property where a collection site had been established in 2012 in a pastureland draw infested with dense leafy spurge. The purpose of the field visit was to learn about collection and re-distribution techniques for populations of flea beetles and oberea. 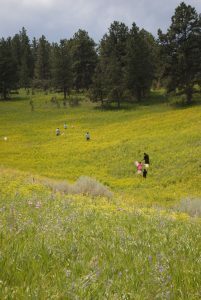 Participants found the afternoon workshop especially valuable and became experts in identifying the various biocontrol agents present in the leafy spurge population as well as witness the entire process of collecting and transporting the insects. Over 25 participants—adults, youth, agency personnel, private landowners—along with MTBCP and SVWC staff and board members, were enthusiastic about collecting and learning more about biocontrol agents. The collection efforts were a great success with approximately 76,500 agents being distributed for local and regional weed control efforts. The 51 containers of “weed eaters” had an estimated value of $5,000. The accomplishments of the day were made even more successful by the participants and facilitators, from diverse backgrounds that brought an interesting array of rangeland and weed management knowledge with them. The conversations and relationships forged provided an opportunity to evaluate various management techniques, as well as share successes and failures. We are very grateful for the MTBCP and all those who participated throughout the day and hope that everyone enjoyed the day as much as we did and look forward to a successful event next year. 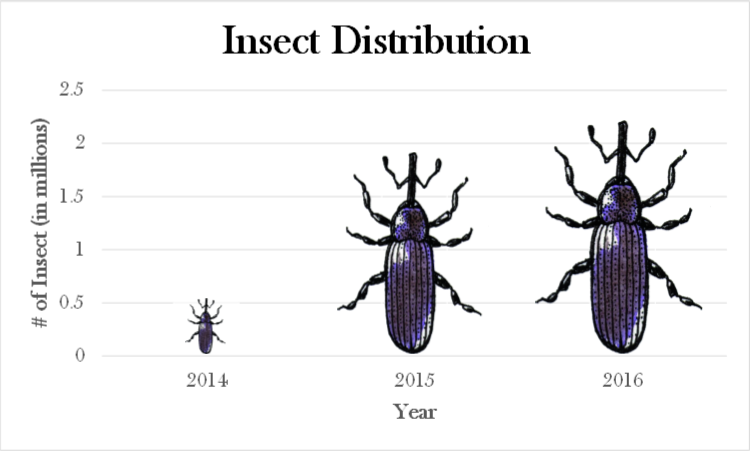 In addition to workshops, insect distribution is a main focus during field season. Around 30 collection days are coordinated for land managers to attend and bring insects back to their weed infestations. 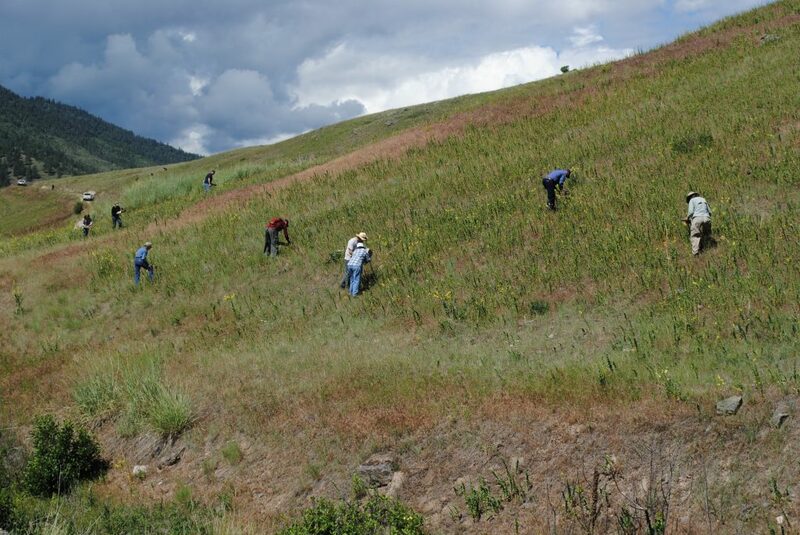 Currently, in Montana we have collection sites for and regularly collect yellow toadflax, Dalmatian toadflax, leafy spurge, and spotted knapweed agents. We are typically collecting on privately owned property and therefore the number of participants is limited. Agency and organization employees are encouraged to attend and distribute the insects to the private landowners that they work with. There are also a limited number of collection days that are arranged for private landowners. Check the MTBCP Calendar for upcoming collection days. When it is not feasible to attend collection days, the MT Biocontrol Coordination Project Coordinator can in some cases ship insects to recipients or provide a list of biocontrol vendors in Montana for purchasing insects. 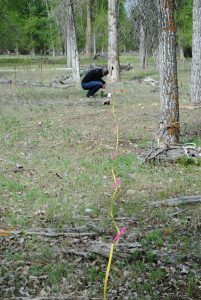 As new biocontrol agents become available, we establish SIMP (Standardized Impact Monitoring Protocol) transects to observe changes in vegetation cover and biocontrol agent populations. Currently, we are monitoring yellow toadflax and the associated stem weevil, Mecinus janthinus. As new agents are released or when agents are released in areas that they are not known to currently exist, we will establish monitoring transects. 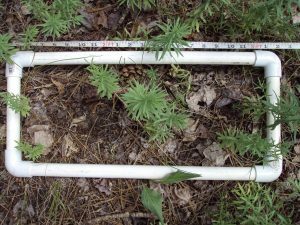 If land managers are interested in monitoring their biocontrol efforts, we have monitoring kits available with all of the necessary tools to establish and read a SIMP transect. Contact the MT Biocontrol Coordinator to obtain a kit. Every fall or early winter we coordinate an annual Montana Biocontrol Meeting. The emphasis of this meeting is on research updates but a wide variety of topics are covered. Majority of the biocontrol researchers working in Montana are present to give updates on their work. Federal, state, and county weed/biocontrol professionals are also present to discuss their programs. The meeting is open to anyone that is interested in attending and is a great way to network and become more involved in biocontrol efforts in Montana. Check the MTBCP Calendar for the dates of this meeting.